AUTHOR’S NOTE: This was one of the last articles I wrote for the U Magazine site. I’m particularly proud of how it turned out considering how little time I had to pull it off. Plus its universal message is fitting for this season. It focuses mainly on Santa Claus and other Christian-themed gift givers. Regardless, the text was intended to represent all characters from all belief systems. Still, I’d like to apologize if I left out your particular favorite mystical being. A special apology goes out to all those of Judaic persuasion in the audience for not taking you into account. I feared you’d maybe get mad at me if I included Hannukah Harry, the Hebrew Hammer and the Holiday Armadillo on the list. Anyway, it’s Christmas so I decided to translate and share this today. Call it an early gift. I wish you all Happy Holidays and, as Nenge Mboko would say, a Merry New Year! Christmas is a time filled with magic, especially for children. However, part of their mature development is leaving behind some of their deepest beliefs. Like the existence of the most beloved characters associated with this special season. Every parent knows that at some point they’ll have to tell their little ones that, as the joke goes, the Three Wise Men and Old Saint Nick really “Ain’t Nick”. So what’s the right way to make the kids understand why they have been lied to throughout their formative period? Health website WebMD recommends its followers to wait until the child itself begins to show signs of suspicion. “There’s really no one right time to tell kids that there’s no Santa Claus”, says teen psychologist Glen Elliott in an interview with WebMD. “The important thing is to take your cues from the child, and not try to prolong the fantasy for your own enjoyment when they may be ready to give it up”. So, what to do when moment they’re ready to listen arrives? The important thing is explaining that every fib, every deception, was in the service of a tradition. One that communicates the positive values inherent in the Christmas season. “Tell your child that the rituals associated with Santa are just one way of expressing the joy of giving and your love for them”, says child psychologist Helen Egger to WebMD. So telling your tykes isn’t admitting you’ve been deceiving them for a long time. Rather, you’re making them part of the tradition and the fantasy, sharing with them the secret and the magic. For example, author Martha Brockenbrough wrote an op-ed letter to her daughter in The New York Times when the little girl asked if her mom was Santa Claus. In short, the writer explains that she’s the one who wrappes and gives the gifts, but no, she’s not Santa. It’s just that his work is so important, it’s too big for just one person. This has gone on for much longer than our own lifetimes. “Santa is a teacher, and I have been his student, and now you know the secret of how he gets down all those chimneys on Christmas Eve: he has help from all the people whose hearts he’s filled with joy”, Brockenbrough wrote. The question is, if they’re going to find out anyway, why not tell the truth from the start? Maybe avoid breaking their hearts later? It’s simple: everyone needs something to hold onto. From the most faithful believer to the most staunch atheist, from the youngest to the most mature. This time of year unites us and fills us with hope. We need to believe that all the Christmas beings exist. Not only that, but that their power and their values live in our hearts. Church, as Brockenbrough would do centuries later for her daughter, justified the existence of the jolly fat man with the red coat and the big old sleigh. How? By blending him with everything positive related not only to Christmas, but to the human condition. 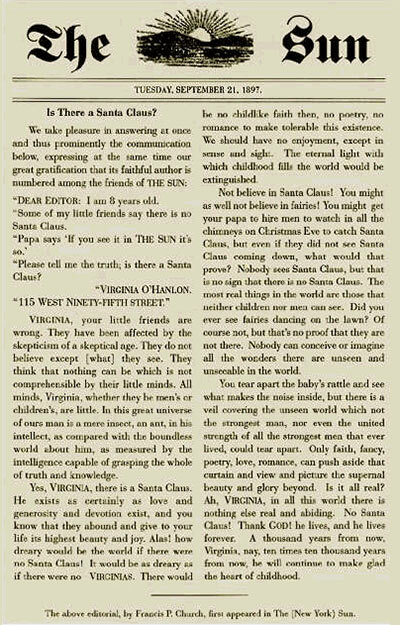 “Yes, Virginia, there is a Santa Claus. He exists as certainly as love and generosity and devotion exist, and you know that they abound and give to your life its highest beauty and joy”, wrote Church. “Alas! how dreary would be the world if there were no Santa Claus! It would be as dreary as if there were no Virginias”. Click here to read Is There a Santa Claus? in the New York Sun website. This article first appeared on December 10th, 2014 at the Revista U website. Click here for the original article (in Spanish). Home » Notebook » Articles » When Can (and Should) You Tell the Truth About Santa?